Before I found the secret of somatics, I use to stretch religiously. I'm actually quite flexible, but no matter how much I stretched, I didn't feel my muscles relax. Now I know why! It was a paradigm shift from the beliefs I had developed from years of dancing ballet and working as a personal trainer. Stretching was what I did, because I believed it was good for me. When I got hit by a car and couldn't move my head or walk without pain in my feet, the stretching --and "core" work -- weren't doing jack for me. Actually I was getting worse. Then one day I found a book on somatics. At first, I flipped through the book and thought--without actually reading the directions--"oh this looks like some of my pilates moves." Again, I believed what I already knew as gospel and the photos of the book were reenforcing my beliefs. Then I read the book. I did the moves with awareness and got instant relief in my left hip psoas area. Volia! I was turned on to pandiculations. The movements of somatics that get muscles to actually relax without stretching! This video explains pandiculations. I went on to study and become a clinical somatic educator. I learned about the stretch reflex, how the brain is controlling what the muscles are doing, and a whole lot more. Reflexes are naturally occurring events within your body to protect you from danger, to keep you safe and alive. If you touch a hot stove your hand is pulled quickly away from the surface before you even know what you've done. That is a reflex. When you force a muscle to lengthen beyond its normal length, the neurons in your muscles get a message from your spinal cord to contract to keep the muscles from being torn from your bones. You don't want that, right!? ;-) When you stretch, it triggers the stretch reflex. Your nervous system is protecting you from injury by triggering the stretch reflex. You may feel you are getting more limber when you stretch but what's really happening is ligaments and tendons are being lengthened. Which results is less stable joints. And these tissues don't rebound like muscles. A slack tendon or ligament is not a good thing. One of the key differences between stretching and somatics, is somatics is re-education. How you move is learned. Forcing muscles to change doesn't work because it doesn't address the feedback loop between your brain and the nerve receptors in your muscles. Pandiculations do. If you want to get rid of pain, and function better so you can maintain quality of life, give pandiculations a try. You can learn more from my website and youtube channel. I work with clients online and in person, so your relief is just a click away. Pain occurs whenever you are injured. Have you ever noticed a bruise on your leg or arm, but have no memory of how or when you got it? Or noticed your cheek is bleeding after shaving but were only alerted by the sight of the blood, but no pain on your cheek? Bleeding and bruising are obvious examples of physical damage to tissues, but no pain because your brain decided it wasn't critical and didn't alert you with pain. There can be times when your brain can't decide if you are injured or not. Like when a small child falls down in the playground and doesn't react immediately, but looks to mom, and if she freaks out then the child starts to cry. Or vice versa, she is calm and the child gets up and moves on to another activity. There is a well known case of a construction worker admitted to the emergency room for a nail through his boot, in pain, only to find out the nail didn't go through his foot at all, but between his toes. The brain is an amazing thing, eh? His brain interpreted the visual of the nail through the boot and alerted him to a painful situation. 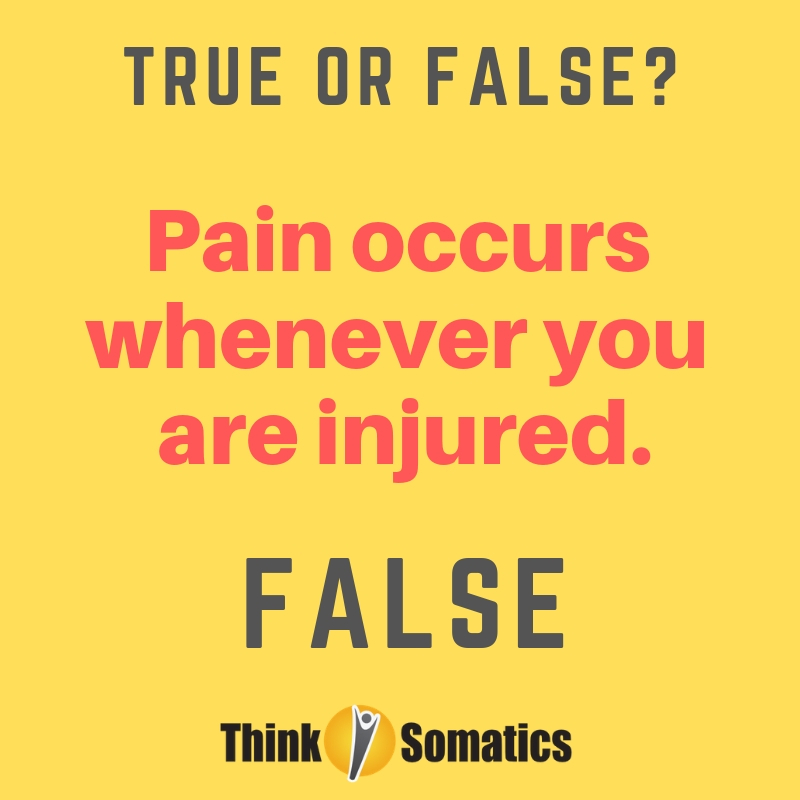 Here is the full Neurophysiology Questionnaire with more True of False questions that can enlighten you about how the brain and nervous system interpret pain. 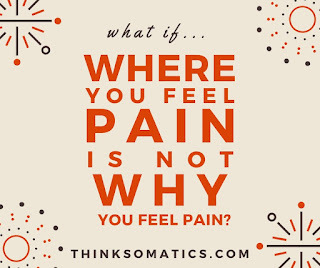 Clinical Somatics is based on neuroplasticity and is a highly effective way to reclaim your freedom of movement and natural ability to release tension and pain in your body. Do you want to move well so you can live well? During March 2019 we are addressing how to free our bodies of tension via the brain and nervous system ala Somatic Awareness. If you can sense it you can change it! No matter what we focus on you will reap wonderful, sensational awareness and relieve yourself of tension that does not serve you well. Join any of all of these classes for somatics movements that free your body so your hips, knees and feet are able to do their jobs with ease vs effort. Join any of all of these classes for somatics movements addressing the neck and shoulders. You'll be amazed at how releasing tension in these area impacts how you walk, what your feet, back and hips feel like. Join any of all of these classes for somatics movements addressing how the torso should be free to rotate, not be rigid. There are spirals to how we can move with ease, and this class will wake up the brain to sense your movement potential. The easiest, fastest, pain free way to get rid of back pain, foot pain, any pain! Most "solutions" to life's problems come at them from the outside. We turn to "experts", or gadgets, or extreme methods to create some sort of change in our bodies and lives. Somatics, on the other hand, addresses the root of all motor patterns and habits, your brain! If you want to create lasting change, you'll get quicker and easier results by addressing your brain and nervous system. Here's an example. Maybe you have plantar fasciitis. Your podiatrist may recommend a heel lift, orthotics, squishy shoes. Some sort of adaptation to the way you are functioning. You have tightness in the back of your body that is literally shortening your musculature along the back of your body and pulling your heel up away from the floor. Adaptive approaches aren't addressing the root cause of your plantar fasciitis. This is like shoving a towel across a drafty threshold, when the true problem is the out-of-alignment foundation of the house, that makes that door not close properly. From the Clinical Somatics perspective, you likely have tightness and tension not just in your calf and bottom of your foot, but along the entire facia/muscular lines, running from your head to toes on the back side of your body. You likely have tightness in your low back and probably into one side of your waist. The experts may also suggest stretches and forceful, painful methods to get the muscles of your calf and foot to stretch. Science now knows that stretching does not work to lengthen muscles. 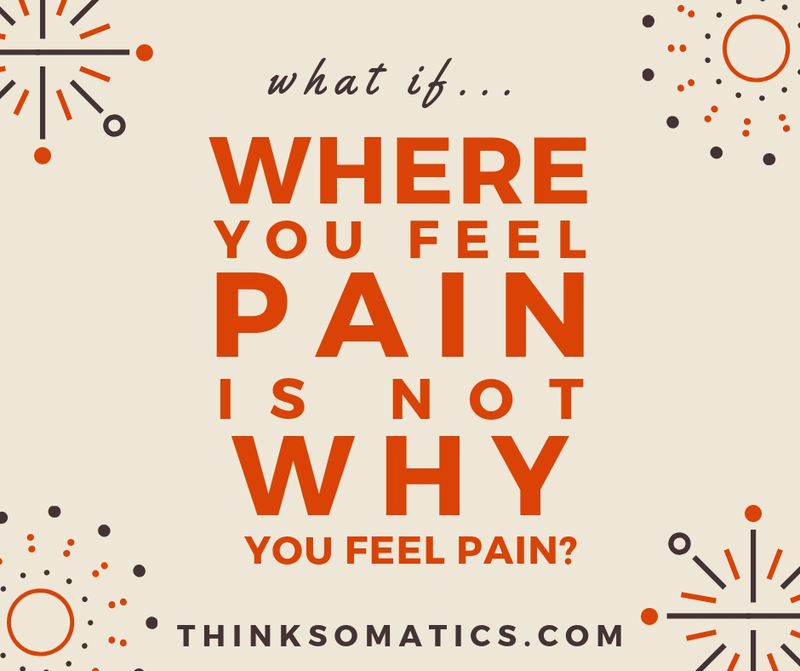 Plus why do we perpetuate treating pain with more pain?! When we experience pain, our muscles contract not lengthen. Again, counterintuitive when you really think about it. Somatics on the other hand, resets your muscles to their natural resting length. We do simple, enjoyable movements called pandiculations. Pandiculations reset the feedback loop between your brain and the nerve receptors in your muscles so they release the muscles to their natural resting length. So simple! Really. Ya gotta try it. This is all based on the science of neuroplasticity. You can change your patterns. You can get out of pain. The brain is the command center of how you function. If you want to function well to live well, go the source, the brain. 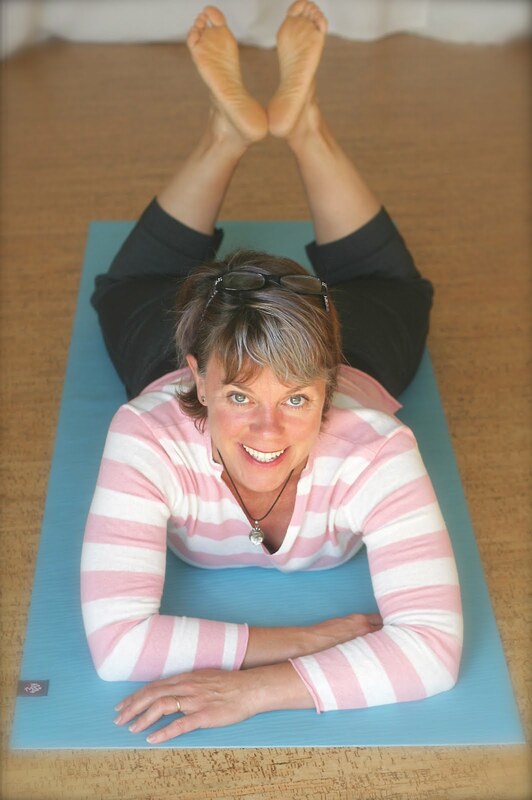 To learn join me for my next FREE ONLINE Intros to Somatics March 3 2019 at 9am pacific time. Can't make it? 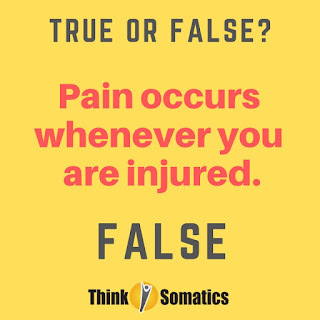 Visit thinksomatics.com and subscribe to get updates for future events. If you have goals to change things in your life, starting in 2019, please join me in these classes. My Think Somatics and Take It Outside Fitness classes are all about being present, openness, freedom of movement and having fun. Ya know, like when we were babies and children. Back then we just wanted to learn and absorb new experiences. But as we grew up our freedom was often stymied. We started to prune away our freedom of movement and literally learned how to not move. These classes are designed to bring your brain, senses, and somatic awareness back onboard, so you can move well so you can live well. This week we will be covering the basics of somatics. Perfect for newbies, but always wonderful for established students to review. We will release tension from front, back sides of body and learn how to rotate with ease. This week we will explore how to torso moves impacts the pelvis, knees and feet; connect the shoulders to the pelvis; and how a free moving spine makes for pain-free feet. How we function (move) is all connected and trying to fix one part and not the whole system is the old-school wack-a-mole approach. 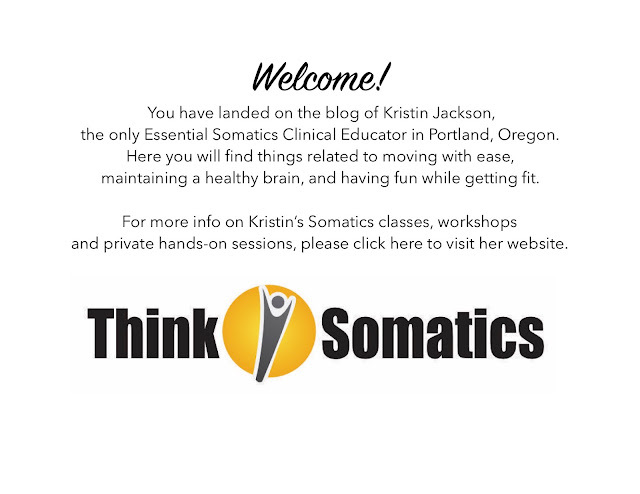 Learn to make your life easier with Somatics! This week we will explore how the eyes influence the way the spine moves; play with head placement in seated and standing movements on Wednesday; and connect how the hands and arms move impacts the pelvis. This week we will explore moves that move a bit faster and bigger. These moves will take you back to playing, wiggling and being carefree of childhood! Every holiday season friends and family make tasty treats. I on the other hand don't have a claim-to-fame recipe. Until now! In November I spent some time down in Mendocino County for my birthday. At Papa Bear's Chocolate Haus I picked up some coffee chocolate bark, and wondered if could make something similar. After playing a bit, I did, and maybe even better! I'm not a big recipe follower, but so many friends have asked me for the recipe. So here you go. This is very simple. It does not require any special equipment like a candy thermometer. I don't even have a double boiler, I just placed a smaller sauce pan inside another one. Go wild. Play with your food, people! Roast the raw nuts in the oven on a cookie sheet for about 10-12 minutes. Make sure they don’t burn. In a small bowl, mix coffee grounds, cocoa powder and a pinch of salt. Melt coconut oil, then mix in the vanilla in a small bowl. Then toss them with the pistachios, then the coconut oil-vanilla, and then toss all of them with the coffee-cocoa powder mixture. Melt the chocolate in a (makeshift) double boiler. Once the chocolate is completely melted, pour about 3/4 of it on to the lined-with-parchment-paper cookie sheet. Spread the chocolate out to form a rectangle, be careful not to make it too thin. As evenly as possible, sprinkle the nuts and coffee mixture over the chocolate. Drizzle the remaining melted chocolate overtop of everything. I kind of spread and smoosh the nuts and chocolate together at this point. Refrigerate until firm, about 30 minutes to 1 hour. Once it cools it easily peels off parchment. Break bark into pieces. Enjoy!!! I don't think I'll be buying any of those specialty chocolate bars anymore. I've played with other variations too. My latest concoction was toasted millet + cinnamon + chipotle powder + sea salt for an adult, crispy, Mexican-ish chocolate bark. Don't ask me about spice amounts. I didn't measure. I always taste along the way when I cook.